Step 1. It checks you're on the cheapest deal. Register for the Club and it'll check you're on the cheapest deal. If you are, great - move to step 2. If not, it'll do a full market comparison to find the cheapest (with lots of guidance) and it'll handle the switch for you. Plus to encourage you, there's up to £30 cashback if you switch via the Club, which you wouldn't get direct. Step 3. Alert you when it's worth switching again. You tell us what 'worth it' means. If you tell us you want to save £100 a year once you can we'll email you; and without you entering new info (unless it's changed), we'll tell you what the cheapest is, and let you shift at speed. didn't the government tell the energy companies that they now have to offer us the cheapest deal? Martin will create a energy price comparison site and then sell for few million. I just do not find the point of this site when there are so many around. didn't the government tell the energy companies that they now have to … didn't the government tell the energy companies that they now have to offer us the cheapest deal? Martin will create a energy price comparison site and then sell for few … Martin will create a energy price comparison site and then sell for few million. I just do not find the point of this site when there are so many around. I generally do a comparison of few comparison sites. Normally most of the websites list all of the deals some of which are filtered based on whether you can switch using the comparison site. The reality is that unless somebody has perfect consumption data you will never know if you are really going to save by switching regularly other than the real saving moving from Standard Tariff to one of the Online tariff. Also depending on somebody's willingness to take risk and not go for a Fixed Tariff at a premium also counts. Well I just registered, and it was really simple and easy to do. It reported back with the results and confirmation that I am on the cheapest deal at the moment. Now I just have to wait for alerts when they believe I can do better. It's not compulsory and wont result in any spam so where's the harm? I would say give it a go, it only takes a couple of minutes. I'm a big fan of Mr Lewis, especially as we got £120 tax rebate last week for the washing of hubby's work uniform. I've been putting it off but his weekly emails keep me reminded of these things. I hope the bloke does do well out of this, he deserves it for the work he puts in to helping everyday folk make the most out of their finances. I think Martin is great for all the work he does and he deserves to "get something out of it". However, I believe the site tells you if you can get cashback so nothing to loose. Incidentally it isnt always the best option to use cashback sites, my partner looked at the deals available and found the best was to stay with her current supplier but on a different tarrif. The moneysavingexpert site was bought by Moneysupermarket last year so the results are likely going to be sponsored. I think Martin is great for all the work he does and he deserves to "get … I think Martin is great for all the work he does and he deserves to "get something out of it". However, I believe the site tells you if you can get cashback so nothing to loose. Incidentally it isnt always the best option to use cashback sites, my partner looked at the deals available and found the best was to stay with her current supplier but on a different tarrif. 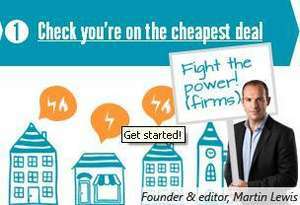 Martin sold out a year ago, and Money Saving expert is owned by Money supermarket. He already got £87m out of the deal. Only the cheapest deal from YOUR supplier not cheapest deal from the market! i signed up to this and the cheapest tariiff for my usage they came up with was over 50 quid a year more expensive than my current one. in other words, if you've already done your research then don't bother with this. This does not take into account cheaper deals that you can get through bundles. I get my gas, elec, landline & broadband from one supplier and have cash back card that is used to reduce my bill further.